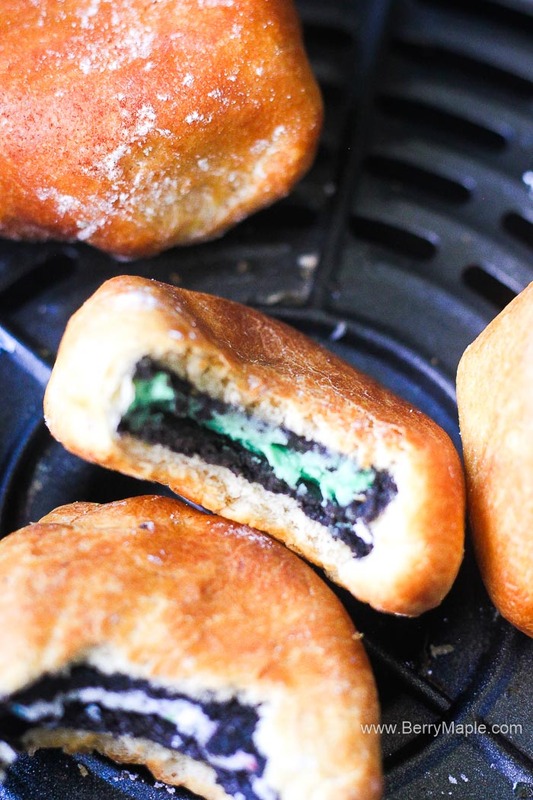 Did you know you can make fried Oreos in your air fryer? What a fantastic dessert and every kid and adult will love it. Easy two ingredient recipe, great even for a beginner! 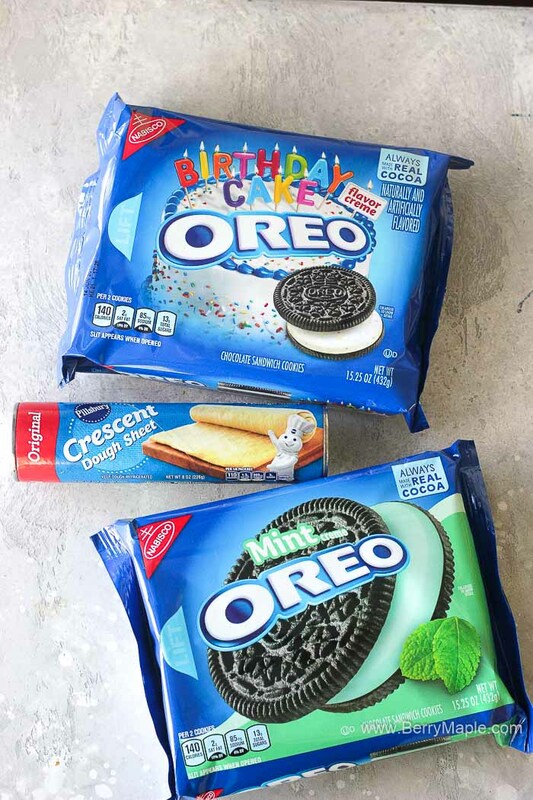 For this recipe i used two different kinds of oreos, Mint and Birthday cake varieties to make colors really pop! I am pretty sure that if you will use the red velvet kind it will be beautiful (well, and tasty) too! 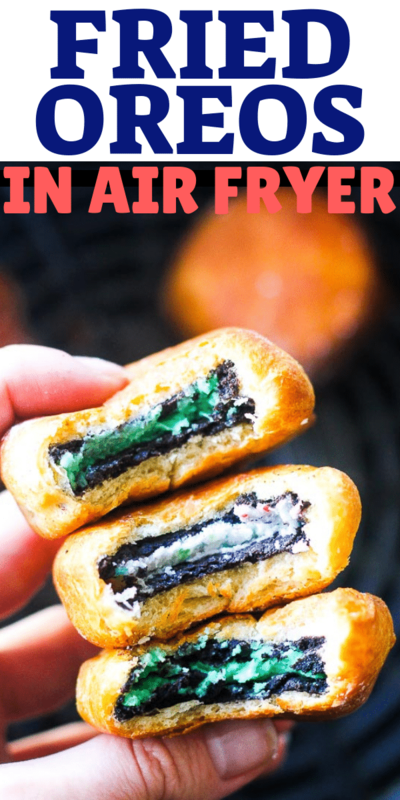 This recipe could be a new spin on a air fryer cooking- easy dessert for everyone, and even great for a party! My kids loved it (they preferred the birthday cake flavor). 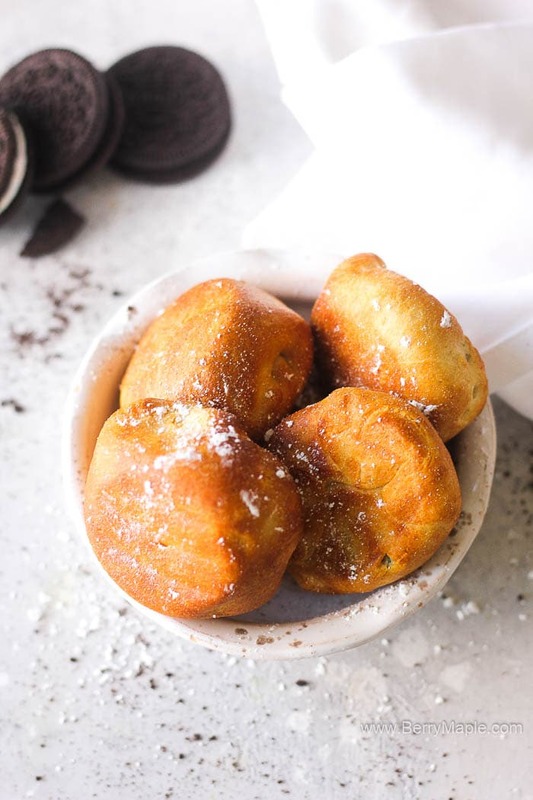 Fried dough ores are pretty sweet and filling so you probably will not eat too much, one was enough for me,but totally not for my kids! 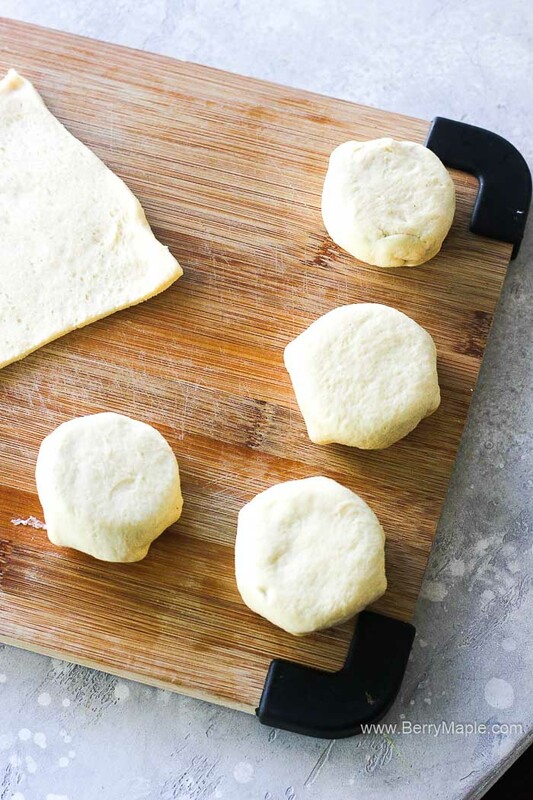 When this little pastries are ready, let them cool for a little and then bite very carefully, the center will be very hot! I don’t recommend letting your fried oreos sit for too long on the counter because they will become hard. But hey, you can always reheat them! For dough i used a crescent dough sheet. I was able to cut 9 even squares to wrap each cookie. Try not to rip it off when wrapping. 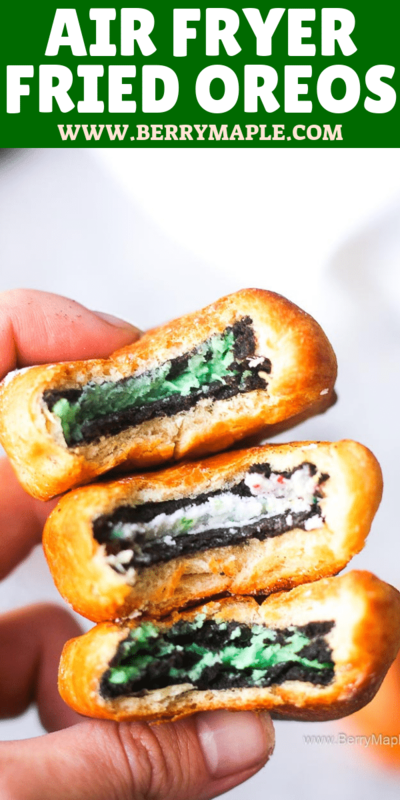 I know lot of people sprinkle air fryer oreos with powdered sugar , I tried it and it was just too sweet. So i added cinnamon on top instead. But you can do whatever you like! Try this little goodies today! Believe me, your kids will love it so as your guests at the party! Try different flavors and let me know how you liked them in the comments! Enjoy! Pop crescent and spread it on the table. Line and cut with the knife 9 even squares. Get 9 oreo cookies and wrap them in that squares. 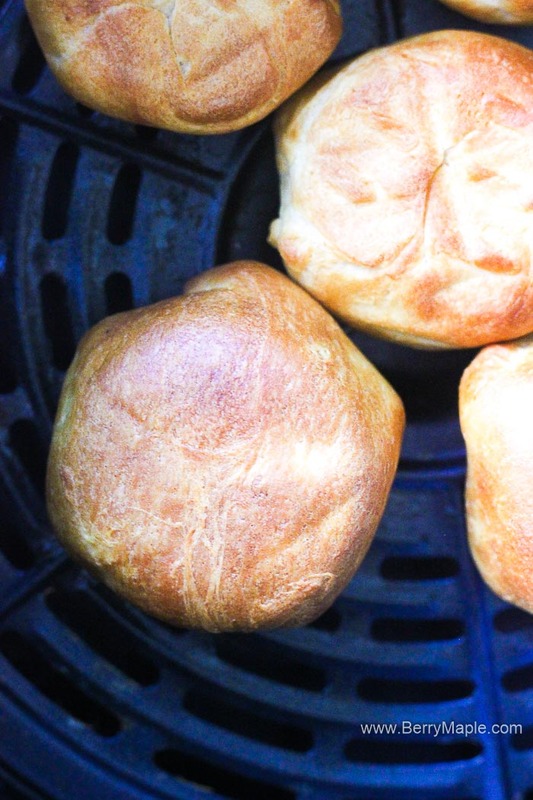 Preheat Air fryer to 360 degrees. Place wrapped cookies in one layer and cook for 4 minutes, shaking and flipping halfway. Sprinkle with powder sugar or cinnamon if desired and enjoy! Genius recipe! My kids loved these easy treats! OMG! This is like the an Oreo lovers heaven! 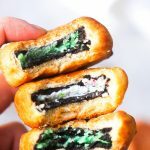 These are so easy and so pretty with those colorful Oreo fillings and I can just see how they would be super popular with the kids. Funtastic recipe!